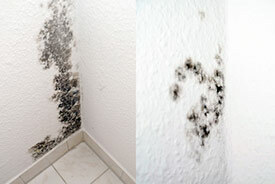 When it comes to mold removal, remediation was the standard for years. This costly, labor-intensive process involves physically removing any building materials that have been affected by mold. Depending on the extent of the problem, the household or business would be disrupted for days or even weeks. Ultimately, though, remediation deals with the symptoms as opposed to removing the cause. Today, MoldExterm treatment has been developed to provide a safer, more effective option. 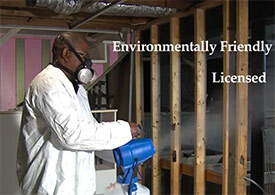 It removes the mold while also creating an environment that will prevent it from reoccurring. With a guarantee to keep mold away, you can now rest easy using the MoldExterm treatment instead of incurring huge expense and disruption with standard mold remediation services. Here's a side-by-side look at the features of MoldExterm and remediation so you can see the advantages for yourself. Remediation is actually based on the principles of asbestos removal that have been carried over and adapted to mold removal. MoldExterm was created specifically to address the unique requirements of treating a mold problem. While remediation relies on pulling out any materials affected by mold, it does little to prevent a repeat occurrence. The MoldExterm process uses an Environmental Protection Agency-registered anti-microbial to kill the mold along with a patented biomedical polymer seal to sterilize surfaces and keep mold from returning. In addition to the polymer seal, MoldExterm services offer sales and service of commercial grade dehumidifiers to reduce moisture content in the air. Many remediation services provide only daily rentals that end once work is finished. Pulling out building materials can actually disperse mold spores into the atmosphere. MoldExterm maintains a healthier environment by encapsulating and treating surfaces with a non-toxic micron mist. By conserving building materials and producing little to no debris, MoldExterm provides a greener solution. Remediation results in a significant amount of mold-covered debris that requires disposal. Remediation services hold a contractor's license while MoldExterm employees are state licensed by the appropriate agency for pest management. Instead of the lengthy and messy inconvenience of remediation, MoldExterm treatment is usually done within the same day, allowing for a quick resumption of normal household or business activities. With mold treatment, removal and disposal of affected materials and reconstruction, remediation costs can escalate rapidly. Other than a new coat of paint, MoldExterm involves mold treatment only for a savings of up to 50% over the price of typical mold remediation. MoldExterm is covered by a service warranty for your peace of mind. Remediation companies may or may not provide a warranty, so you need to be sure and check beforehand. When it comes to the safety of your home or building, don't take any chances. MoldExterm incorporates the most up-to-date methods for non-toxic, effective mold removal. Please contact us for more information about our services. Call us at 888-887-8376, we offer a free mold inspection and price quote.